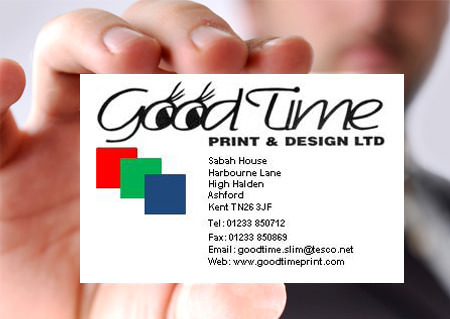 A business card is often the first impression of your company a potential customer gets so you will want it to be the best business card possible, order them form us at Goodtime Print Design (Digital) Ltd in Kent and you will not be disappointed. We use the best digital and litho printers money can buy to provide stunning results for all of our business card designs in London, Kent or anywhere in the UK. The design ideas for a business card are only limited by your own imagination. Most modern business cards follow a simple formula, one side often carries the persons business information such as, name, title, contact telephone number, email address, website, and possibly bank number and vat registration number. The other side of the business card often has an image of the company logo or a high quality photograph of the products the company offers. If you have a design already we can print it for you or if your stuck for inspiration why not have one of our fantastic graphic design team work with you to create something truly unique to make you stand shoulders above your competitors in London, Kent or anywhere in the UK. 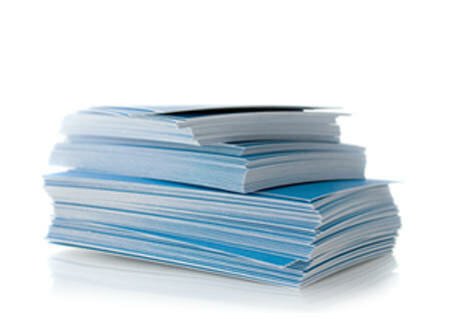 Give us a call and we can advise you of the cost of the artwork and a proof will be sent for your approval. Our business cards are printed on 300gsm matt. Our business cards are printed digitally from your artwork via a PDF or JPEG. We can also do the design for you and advise you of the artwork cost and a proof will be sent. We do standard business card size which is 8.5cm x 5.5cm (unless otherwise stated). Prices include delivery. Our business cards are printed on 300gsm matt, as we feel these give the best quality at a competitive price. Our business cards are printed digitally from your artwork via a PDF or JPEG. We do standard business card size which is 8.5cm x 5.5cm (unless otherwise stated). Prices include delivery.